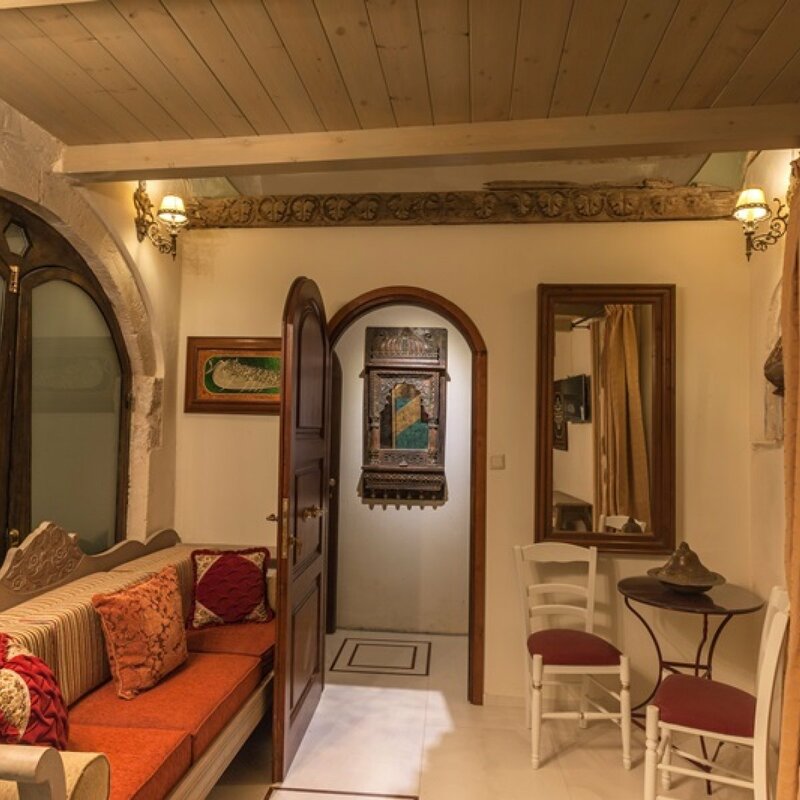 Suite in different levels.On the ground floor is located the living room in a high-ceiling arched room. 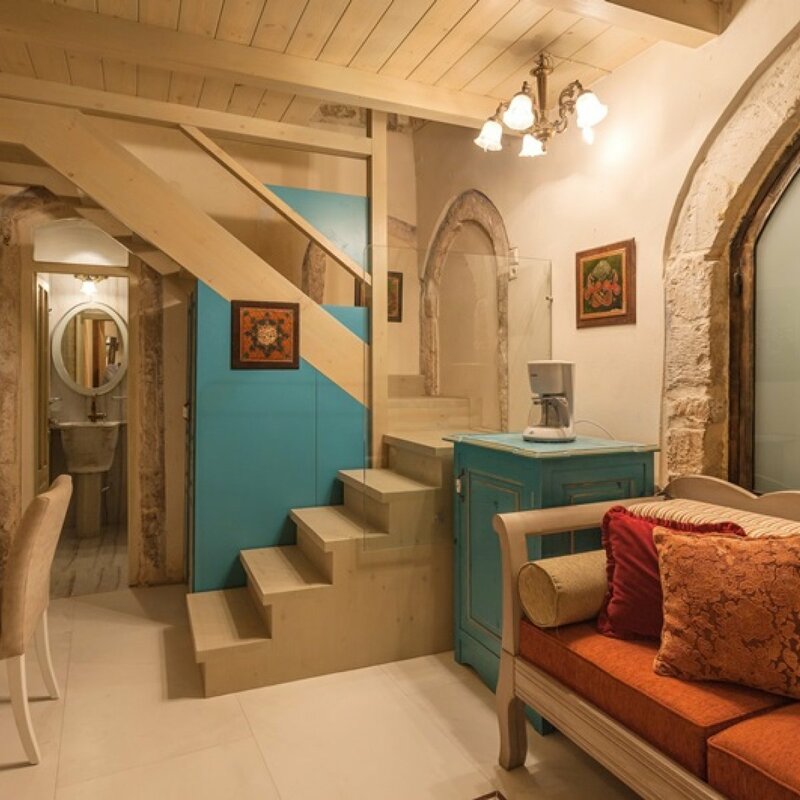 It includes a sofa-bed that can host one person and a bathroom with shower that was part of the old hamam. 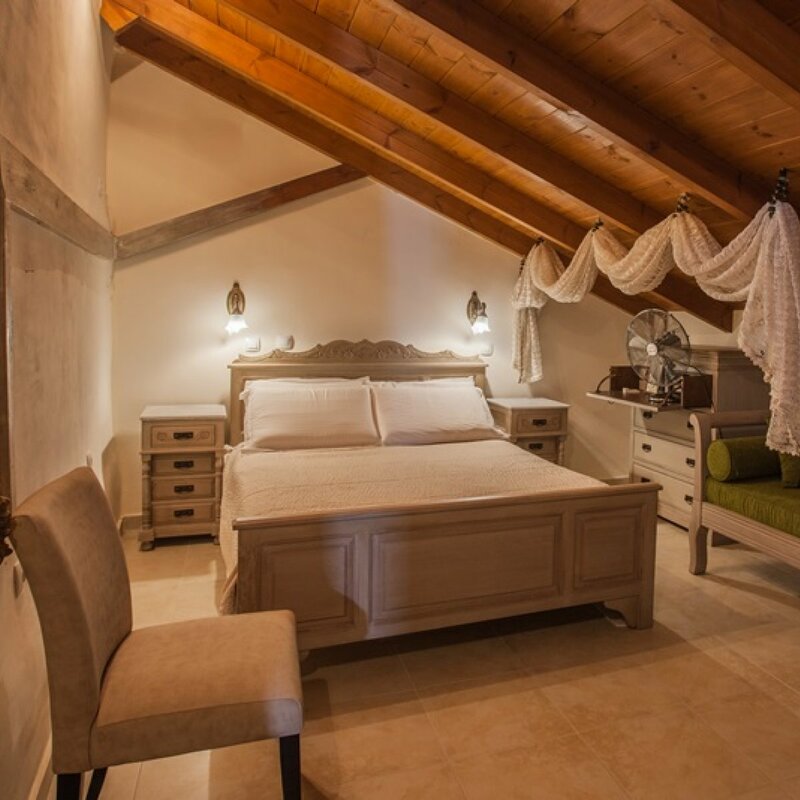 On the wooden attic it includes two single beds, in a characteristic arched room. On the first floor there is a single room with a WC (12,00 sq.m.) and a small terrace next to the hamam dome with an outdoor hydro-massage bathtub for one person. All children under 12 in baby cots are free of charge (max. 2 cots in each apartment). There is no capacity for extra beds in a room. Maximum capacity for baby cots in a room is 1. Bookings by credit or debit card. Full payment (100% of the total price of the booking) will be charged upon arrival. Cancellations made at least 21 days prior to arrival will not incur any penalty fee. Later cancellations or changes will incur a 1-3 night charge. “Non-show” will incur a 100% charge. 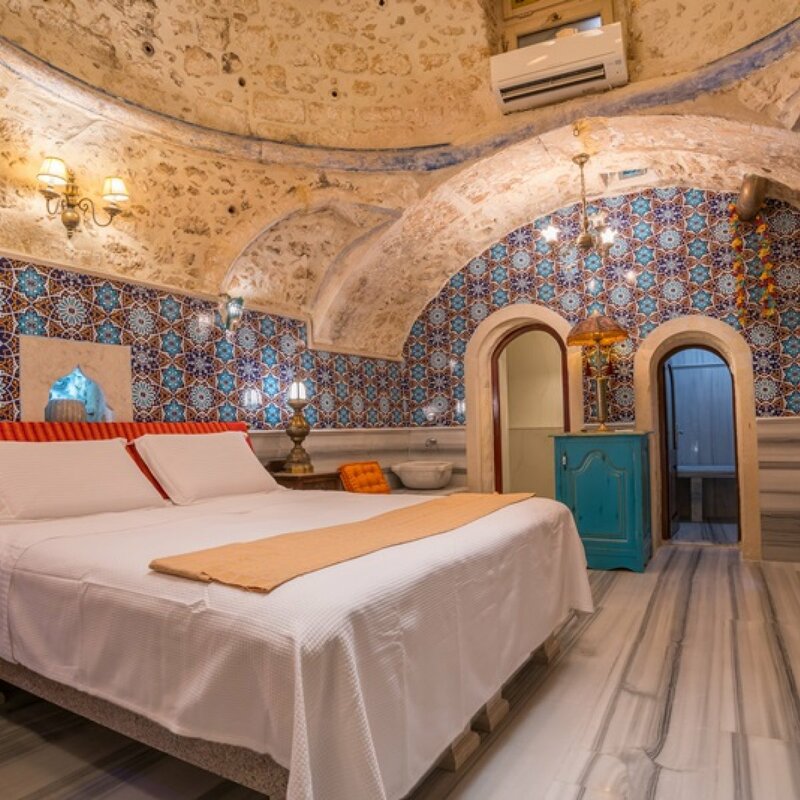 Authentic room of the Ottoman Hamam that was constructed in the middle of the 17th century. It is consisted of a big, of distinctive architecture, high-ceiling roomfo total area of 31,00 sq.m. It includes a big dome that is based on spherical triangles, marble benches, basins and floor from "MARMARA" marble of Istanbul and authentic ceramic tills from Isnic, Turkey. 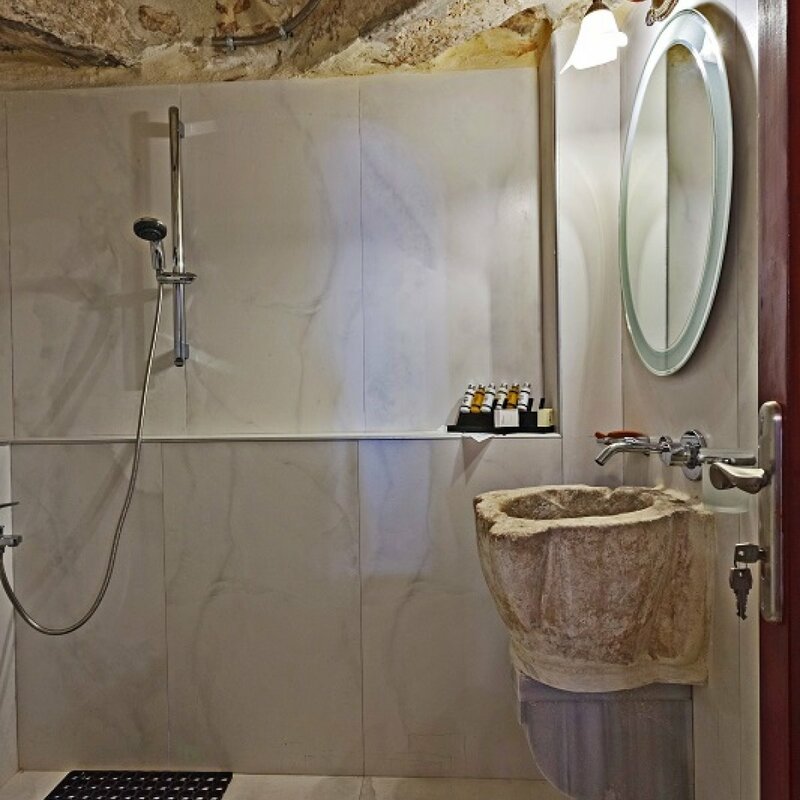 It has a bathroom with shower that was part of the old Hamam. 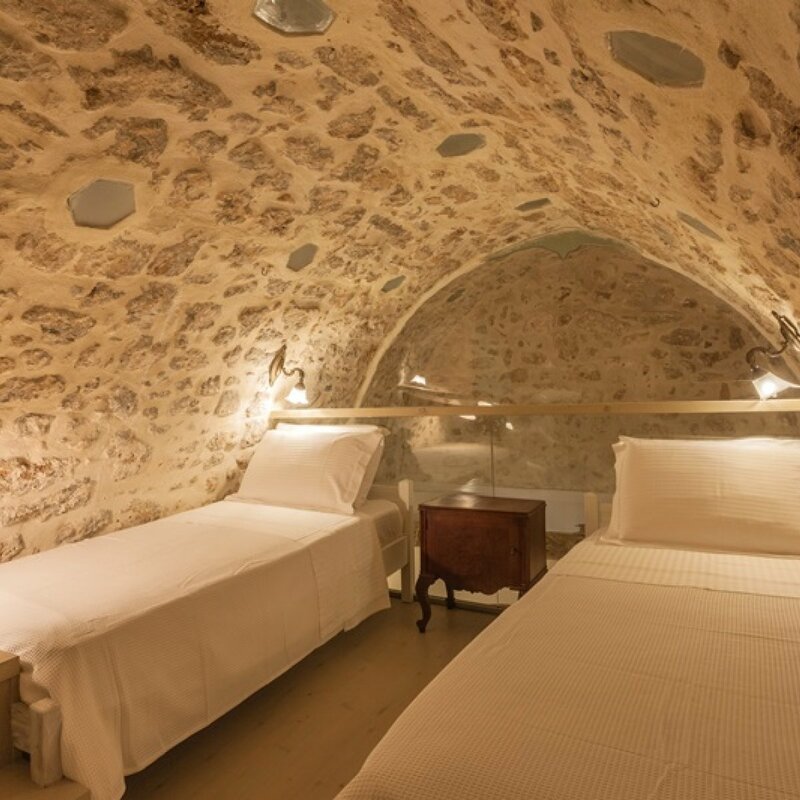 In the room is included the Hamam (Turkish Bath) with exclusive use for up to 5 persons, with marble benches and basins. Exclusive Hamam in the room. 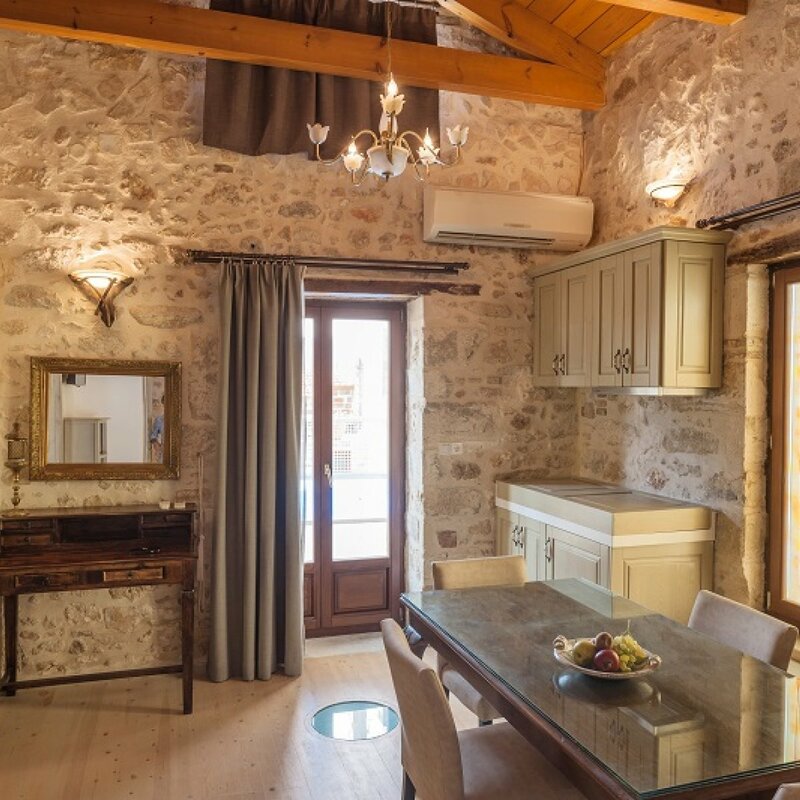 Two-room Suite with attic, the Ottoman "onda". 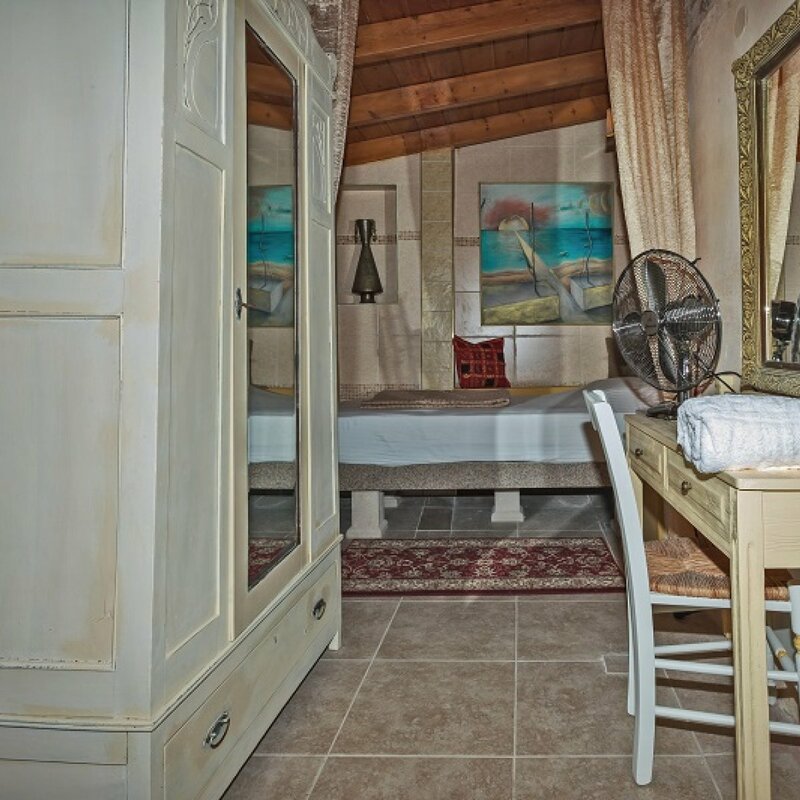 It includes a double bed, bathroom with hydro-massage shower. In the living room there is a big stone fireplace and a sofa-bed with a second bathroom. The suite has a total area of 58,00 sq.m. In the attic there is a room with one single bed. 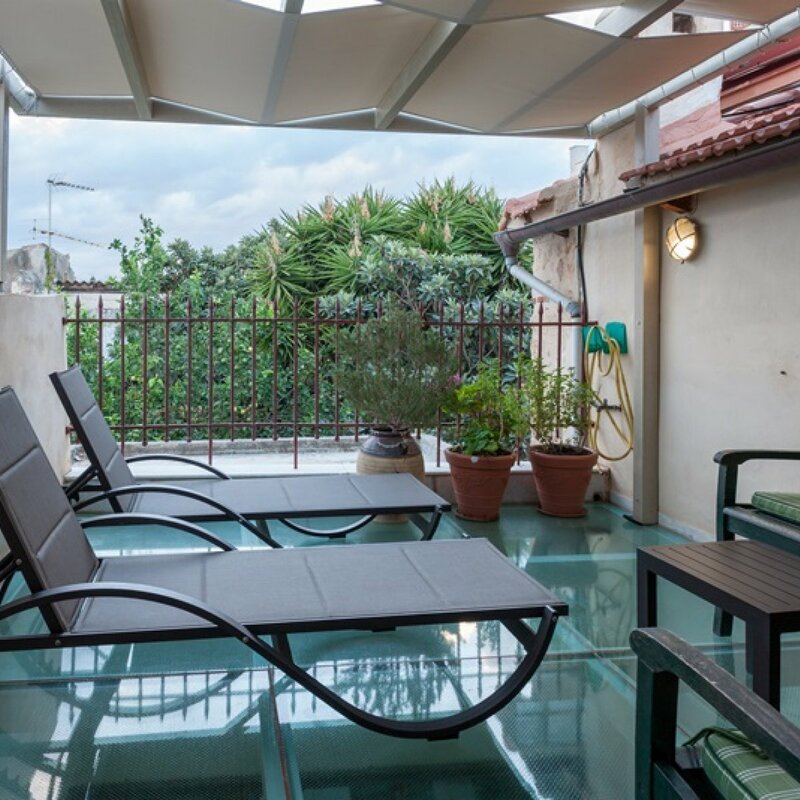 It has a spacious terrace with exclusive use, with acqua area, sunshade, outdoor living room and sunbeds. Big antique table with three seats. Kitchenette with two hotplates, basin etc. *From 01/11 until 31/03 breakfast is NOT included in the price. 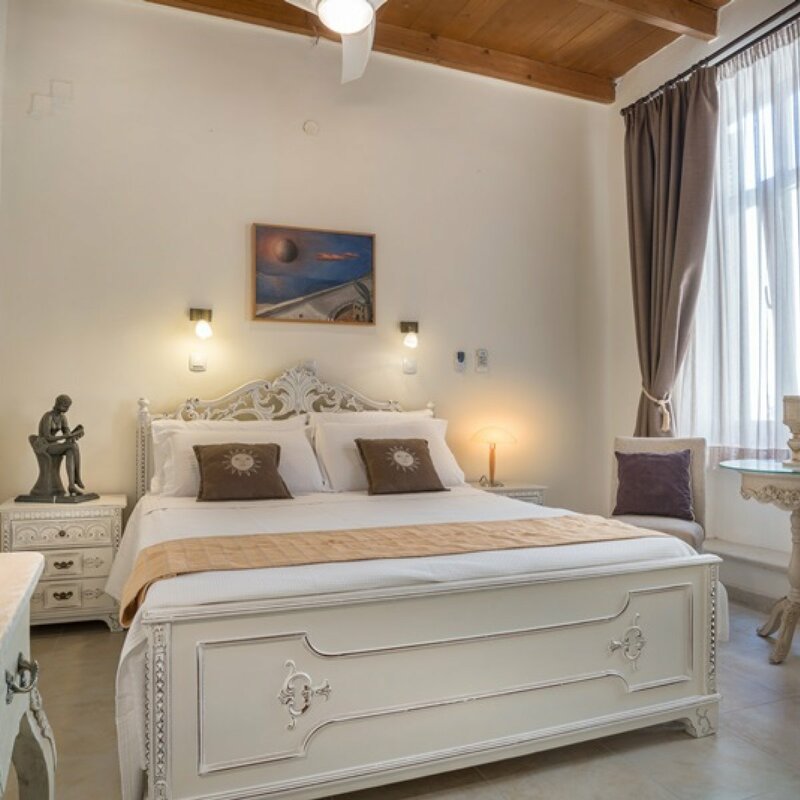 Double room on the first floor in a total area of 21,00 sq.m. 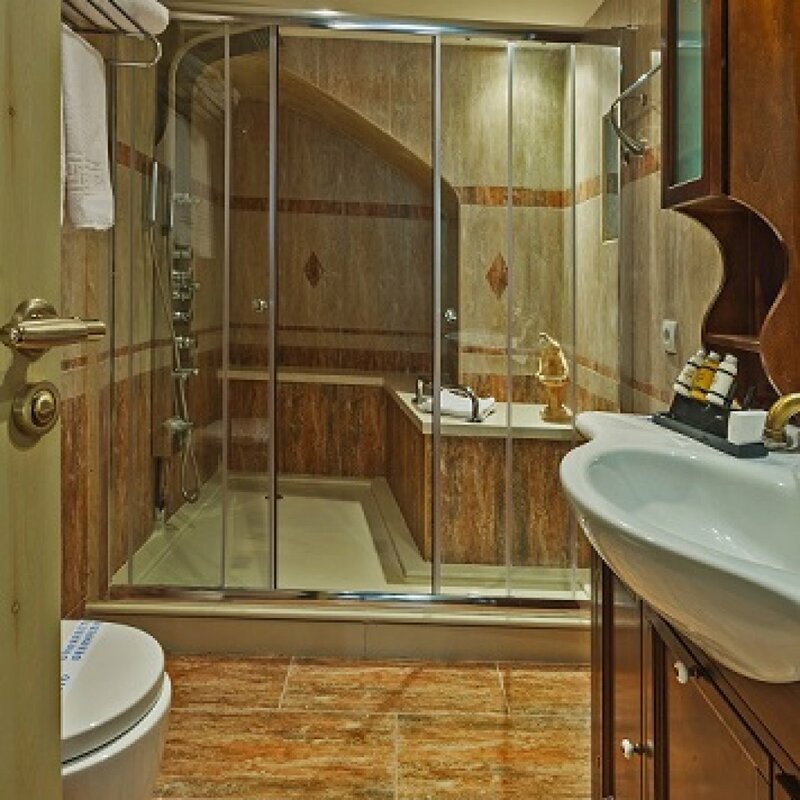 , bathroom with hydro-massage bathtub. On the first floor there is access in a "solar area" with living room and a notable mosaic. 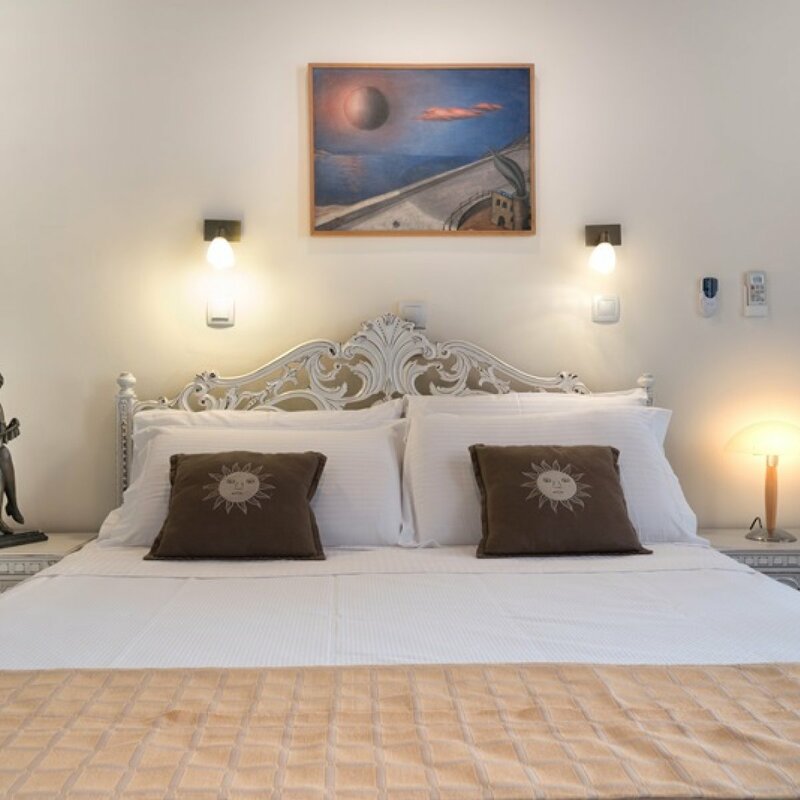 Double bedroom on the second floor in a total area of 31,00 sq.m. with a sofa-bed with wardrobe and bathroom with shower. Kitchen with two hotplates, basin and table with two seats. 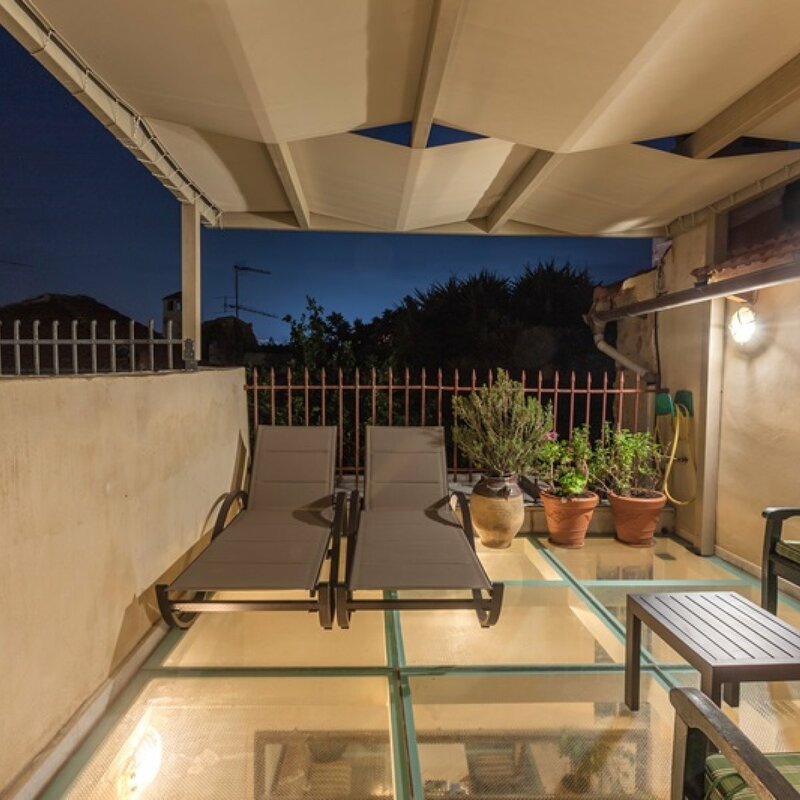 Terrace with outdoor living room and sunbeds. There are no extra services available.